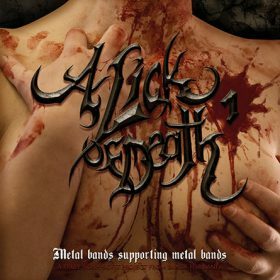 A Lick Of Death - A non-profit project from bands for bands. … is a non-profit project from bands for bands, funded by bands, created by bands and distributed by bands, initialized and organized by Raven Tongue (Mytherine) and supported by friends and musicians like Stephan (ex-His Masters Descent), Hendrik (Maat) and others. Each sampler contains 10 songs of 10 bands, dedicated to metal music in good to awesome quality and is limited to 1,000 copies.